In-ears are wonderful. Instead of having loud sound blasting into your ear drums from wedges, confusing your aural space and permanently damaging you, you can create a private audio environment. You can choose the mix and volume, according to your preference. You can use a clicktrack. You can use a backline mic to communicate with the band. You can save yourself from going deaf. You can end gigs, services and shows without a persistent ringing and feeling of intense fatigue. Often the best solution for a situation is using high quality, expensive technology. But money isn't always in abundance, so it's time to use things laterally. So much tech is manufactured nowadays, many-many-many problems can be solved by cobbling together things in new ways, beyond how they were originally built. It's one thing to take something apart, solder in new pieces, and call it fixed. But it's another entirely to just plug things in backwards and watch it work anyway. The following guide is all about that. That isn't a lie or click bait, it's true. If you want in-ear monitoring for your band or church, you can have it for only $30 a person. In-ears change everything. The headphones themselves come in a couple dozen varieties from many companies, but the actual monitoring of each station is often prohibitively, and confusingly expensive. 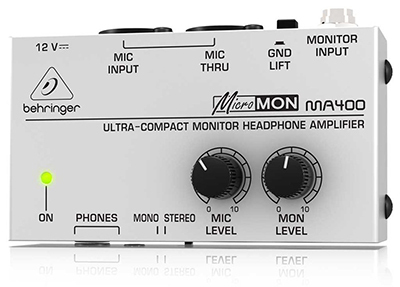 The cheapest method I've found for something reliable is using a Behringer MA400 Headphone Amp. Amazon Link. It's true. But in order to make my case, I need to explain a bit about how monitors work. Firstly, it's important to define some terms. When you plug a keyboard, or a microphone into a mixer, you're plugging into the inputs. When you send (popularly referred to as a bus) audio, you are using the outputs. The most basic mixers have at least one input, and at least one output. Without these two features, it isn't a mixer. The main output of a mixer is usually shortened to main, or mains. This is typically (99% of the time) a stereo pair of two jacks, one left and one right. The other outputs of a board are referred to as aux, or auxiliary outputs. These are the ones used for wedges, and in-ear monitoring. There are two types of aux sends, pre-fade and post-fade. Pre-fade means that the signal sent to the auxes is only effected by the gain on the mixer, not the faders. Post-fade means the fader effects the volume of the aux send. All aux sends use line level, balanced signal. I will explain this below. For any in-ear applications, for safety reasons, only use pre-fade. You do not want to accidentally triple the volume in someone's ears and blow their eardrums. It's usually fine to run wedges off of post-fade, since it's much less dangerous. Fill up your pre-fades with in-ear channels, then put your wedges on post-fade if you run out. Another type of output is referred to as an effects send/return loop, but we won't be covering that here. This is not an appropriate way to send monitor signal. In short, do not use this for monitors. Really, don't do it. Balanced and Unbalanced Signal, Explained. There are about two dozen different cables used in audio, but most of them are designed around whether they implement balanced, or unbalanced signal. Unbalanced signal is the type used most commonly for guitars, electric basses, some keyboards, and a few (read: cheap) microphones. Unbalanced audio is the oldest method still used for audio, and is also the cheapest to manufacture and implement. There are only two pins used on the plug, a hot and a ground. The extremely common 1/4" TS (short for Tip-Sleeve) cable (used by guitars and basses) is unbalanced. The benefit of unbalanced audio is its simplicity. However, the limitation is the length of the cable. An unbalanced audio cable is an antenna, so anything longer than 30 feet will pick up increasing levels of interference (hiss) and add them to the line. 1/4" TS cables should never be used if they're longer than 30 feet. Balanced signal is a three pin upgrade to unbalanced. Instead of two wires, the three wires are hot, cold, and ground. The hot and cold are identical, but their polarity is reversed. This is most often seen with an XLR plug. Why is this important? On the other end of a balanced signal is a differential amplifier. This compares the difference between the two (which in this case would be any picked up noise), and then subtracts it. You can run balanced signal up to 300 feet. Why Did You Tell Me All Of This? It's very common to think of cables by their plugs instead of their properties. An XLR plug on the end of a cable does not make it a microphone cable. A 1/4" plug does not make it a guitar cable. Note: XLR and 1/4" TRS are 100% the same in functionality, but just use different plugs. The signal is the same. You want to use balanced cable with balanced inputs/outputs, and unbalanced cable with unbalanced inputs/outputs. Yes, and this is the most common culprit for any problems I see with people using audio, so any chance I get to spread the word, I do. Microphone level, instrument level and line level are three "standards" used to set the gain of a particularly electrical device. Gain is a ratio of the signal to noise, or metaphorically, it's an electrical handshake between two devices. Everyone has differently shaped hands, and different backgrounds for how a handshake should be done, but roughly there's an expectation between everyone for what a handshake should be. Microphone level is roughly -30 dBu, and is the normal electrical relationship of microphones and DI boxes. This is the level that comes out of a microphone or DI (DI's convert unbalanced to balanced) when it's plugged into a board. Line level (also commonly known as unity gain) is between -10 and +4 dBu, and is a much, much stronger signal designed to give a "standard" between audio devices to pass signal, like mixers and preamps, or compressors. I put standard in quotes, because the quality of the device (usually, the price) will determine how close to the standard of +4 dBu it actually is. There's a lot of wiggle room here. The distinction between the three is important, because mic level inputs are designed to receive mic level signal. Instrument level inputs are designed to receive instrument level signal. Line level inputs are designed to receive line level signal. If you put mic level into a line level input, it will have hiss and sound weak, because it needs amplification. If you put line level into a mic level input, it will most likely clip and distort. Remember how I said aux sends used line level, balanced output? That should make more sense now. This is the reason that aux sends do not have a separate gain knob and a fader. They just have one level knob. They are calibrated to send line level. On the backside of the MA400 are three jacks, Mic Input, Mic Thru, and Mon Input. It's designed to receive balanced audio. From the manufacturer's intention of the device, the Mic Input jack was put in to allow a microphone to be plugged directly into the box using an XLR. Then another XLR would be used bridge the Mic Thru with the mixer, and the aux send would be plugged into Mon Input using a 1/4" TRS. I do not recommend using the device in this configuration. To start, the microphone preamp on this is not good. Full stop. So don't use it to power your microphone. Also, this configuration of using the device like this requires adapters if you use a snake. The gender of the XLR plugs would require either matching gender on the snake, or an adapter. These can really add up in price. Finally, the Mon Input uses a 1/4" TRS cable, which is also an uncommon thing. Instead, we'll do this entirely incorrectly. Plug your XLR (from the aux output) directly into the Mic Input. The quality of the Mon Input sound (over the Mic Input sound) is not worth the price of the cable. Also, because the Mic Input is not designed to receive line level (coming out of your board), it acts as a very nice safety warning by clipping and distorting when the signal coming from the board is too high. Instead of quickly driving dangerous levels into your ears, it can act as an early warning that somewhere on the mixer, a knob is too high. Set the aux level output (on the board) to about a 2/5, and never take the Mic Level on the MA400 above half. Since this box needs to sit on the floor, I recommend a 1/4" to 1/8" headphone extender of no more than 10 feet. The shorter, the better. Amazon Link. As with anything involving in-ear monitoring (IEM), safety is absolutely paramount. Your ears do not get better, and headphone amps are a fast way to hurt yourself if you're not careful. Never take the level of the MA400 above halfway, even if the signal sounds weak. Fix the signal on the other end (with the board), or check your cables. You do not want to send hot signal into your in-ears and hurt yourself. I'm not responsible for you if you do. Really, legitimately, safety first. This is one of those things requiring 100% responsibility, all the time. In-ears are constantly debated for their sound quality, but we've found a few that have been consistently good for comfort, isolation, and quality of sound. Anything custom molded will usually have much better isolation, and comfort. The prices on these can escalate, but the cheapest on here are surprisingly good. Note: Do not use in-ears that have a microphone built into them. This is a different kind of plug, called a TRRS (Tip-Ring-Ring-Sleeve) and will not work correctly with the MA400. This includes Apple earbuds. Shure SE215: http://amzn.com/B004PO10E2 - $99.00 - Our usual recommendation, these sound great and are very comfortable. Shure has a great warranty policy. 1964: http://www.1964ears.com/ - Start at $399 and go up. These are custom molded. Ultimate Ears: http://pro.ultimateears.com/ - Start at $600 and go up. These are custom molded, and can be worn literally all day without fatigue. I use UE-11s.